Coca-Cola is recognized across the globe as the most valuable brand in history, as well as the second most recognized phrase in the world after “hello.” In many place across the globe purchasing a Coke is ironically easier and less expensive than accessing clean water. Although Coke attempts to portray itself as a socially and environmentally conscious company, the reality is that it’s deeply connected to pollution and water shortages. Additionally, the acidity of Coke has led many to question the toxicity of the product, relating to long-term human health, as its pH rating is only one point higher than that ofbattery acid. In a study sponsored by the National Heart, Lung and Blood Institute, researchers found that individuals who consumed at least one soda a day had a 44% higher risk of developing metabolic syndrome during the four-year study. The team studied more than 2,400 middle-aged white residents of Framingham, Mass., specifically focusing on the more than 1,600 people who showed no signs of metabolic syndrome at the beginning of the study. These individuals were then tracked by the researchers for at least four years. 5. a trend toward an increased risk of high blood pressure. In a separate study, it was revealed that people face a 48% increased risk of heart attack or stroke when consuming one or more sodas per day, as compared to those that don’t drink it every day or at all. Soft drink consumption has also been linked to respiratory disorders such as COPD and asthma. Although seemingly not good for the human body, the extreme acidity of Coke makes it work as an excellent cleaning agent. To give you a better understanding, a pH of 0 to almost 7 is in the scale is acidic, while from 7 to 14 is alkaline on the scale. To put things into perspective, the pH level of battery acid is a 1, with pure water having a pH of 7. In tests done on the acidity levels of Coke, it was found to have pH levels as low as 2.5. Consequently, it can clean surfaces as well as (and often better than) many toxic household cleaners. 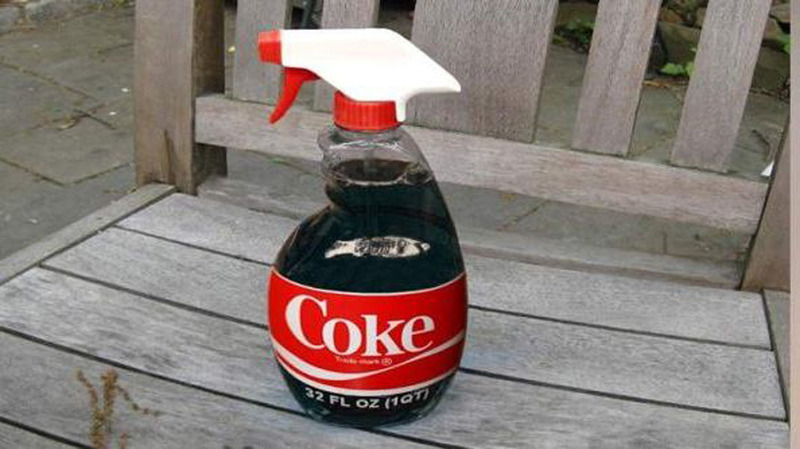 Here are 10 uses of Coke as a domestic cleaner , which show it isn’t fit for human consumption. 1. Remove rust: methods include using fabric, a sponge, or even aluminum foil dipped in Coke. 2. Remove blood stains from clothing and fabric. 3. Clean oil stains from a garage floor: let the stain soak, hose off. 4. Clean burnt pans: let the pan soak in the Coke, then rinse. 5. Clean your engine; Coke distributors have been using this technique for decades. 6. Make pennies shine: soaking old pennies in Coke will remove the tarnish. 7. Remove stains from vitreous china. 8. Clean your toilet: pour around bowl, leave for a while, flush clean. 9. Coke and aluminum foil will bring Chrome to a high shine. 10. Strip paint off metal furniture. Soak a towel in Coke and lay it on the paint surface. Coca-Cola is obviously a product that has many wonderful uses. Although the record indicates that the best uses of this product are not associated with consuming it!